Everyone is bullish. Contrarians know that must be bearish. However, everyone has been bullish for a while, yet the S&P 500 rose to a record high of 2117 on April 24. That’s because everyone has finally figured out that fighting the Fed in particular and central banks in general is dumb. So we are all smart now. As a result, bullish sentiment is at a record high, though the bull market, which is more than six years old, is no spring chicken. I calculated the 52-week moving average of the Investor Intelligence Bull/Bear Ratio. At 3.46 this week, it is the highest in the history of this series, which starts in 1987. The 52-week average of the sum of those who are bullish or expect a correction rose to 84.4%, also a record high. The percentage of bears fell to only 13.9% this week, with the 52-week average down to a record low 15.5%. There are lots of correlations between S&P 500 forward earnings and several key economic indicators. The former dropped sharply late last year and early this year as Energy industry analysts slashed their earnings estimates for this year and next year. While the plunge in oil prices accounts for much of the weakness in forward earnings since last fall, the soaring dollar has also weighed on earnings. Corporate profits tend to be the key driver of employment and capital spending. Profitable companies tend to expand their payrolls and capacity. Unprofitable companies don’t do so. This explains why there is such a good correlation between the y/y growth rates of forward earnings and aggregate weekly hours. Forward earnings is also highly correlated with total factory orders as well as nondefense capital goods orders excluding aircraft. The weakness in forward earnings confirms that the slowdown in US economic growth so far this year wasn’t attributable just to the icy winter. Spring’s economic indicators remain disappointing so far. 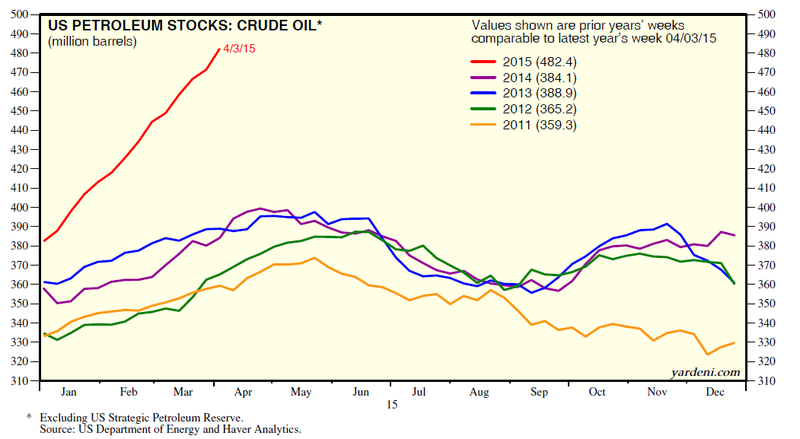 The profits picture should brighten a bit if the dollar has peaked and oil prices have bottomed. The US economic outlook should also brighten in this scenario. However, don’t expect a boom. There’s an important debate about wage inflation. The inverse relationship between wage inflation and the unemployment rate is known as the "Phillips Curve." It makes sense that wage inflation would rise or fall depending on whether the unemployment rate was relatively low or high. However, I have been arguing that the Phillips Curve might not work as well given increasing globalization, innovation, and competition. In his Barron’s column this week, Gene Epstein argues that wage growth is about to take off. He bases this forecast on a version of the Phillips Curve model devised by Jason Benderly of Applied Global Macro Research. In addition to the level of the unemployment rate, this model includes the change in the jobless rate, labor productivity, and the after-tax profit margin. I note that the unemployment rate remained at 5.5% during March, the lowest since May 2008, yet wage inflation remained subdued for all workers at 2.1%, while falling recently to 1.8% for production and nonsupervisory workers. On the other hand, as we noted last week, wage inflation over the past three months through March for all workers jumped to 3.9% (saar), the highest since December 2008. That might have reflected the one-shot impact of the widespread hike in the minimum wage at the start of the year. Or else, the Phillips Curve is starting to work, finally. (1) Business surveys. Three of the six regional business surveys that I track are available through April. The averages of their composite indexes tend to be highly correlated with the national M-PMI. The average for the FRB districts of Kansas City, New York, and Philadelphia fell to -0.2 this month from 2.6 last month and a recent peak of 18.8 during November of last year. It’s the lowest since May 2013. The average of the three new orders indexes was -5.8 this month, about the same as last month’s -6.2, which was the lowest since October 2012. The employment index fell to 1.0, the lowest since November 2013. (2) Flash M-PMI. The national flash M-PMI compiled by Markit fell from 55.7 in March to 54.2 this month. The ISM’s M-PMI was much weaker than Markit’s reading in March. The same is likely this month given the weakness of the available regional surveys so far. (3) Durable goods orders. The weakness in the regional orders indexes was confirmed by Friday’s release of March durable goods orders. While the overall number rose 4.0% m/m, boosted by a surge in aircraft orders, nondefense capital goods orders excluding aircraft fell for the seventh consecutive month through March, by a total of 6.7%. Orders have been especially weak for primary metals, fabricated metal products, machinery, and electrical equipment, appliances, and components. That probably reflects the combined depressing impact of lower oil prices on the energy industry and the higher dollar on exports. (4) Lumber prices. In recent days, I’ve noted the plunge in lumber prices since the beginning of the year through Wednesday. That’s not a good omen for housing starts or the S&P 500 Homebuilding Index. Neither is the flat trend in railcar loadings of lumber and wood products over the past year. New home sales fell 11.4% m/m during March. At the beginning of 2013, in the 1/29 Morning Briefing, which was titled “Nothing to Fear but Nothing to Fear.” I noted: “In recent discussions, some of my professional friends told me they are now worrying that there is nothing to worry about. They note that there may be too many bulls for the good of the bull market.” I also noticed that many of them had “anxiety fatigue.” After the widely feared Fiscal Cliff was averted, investors seemed to be less prone to anxiety attacks. In other words, they were less prone to sell on bearish news, and more likely to hold their stocks and add to their positions on any weakness. (1) Anxiety fatigue. Since the start of the year, the S&P 500 has been trading between a record high of 2117 on March 2 and a low of 1992 on January 15. There have been lots of panic attacks since 2013, but none that turned into significant corrections. Recent worries that the plunge in the oil price might trigger a rout in the junk bond market haven’t panned out. China’s latest batch of weak economic indicators has been mitigated by the PBOC’s easier monetary policy. The winter/spring economic slowdown in the US increases the odds of a “one-and-done” or “none-and-done” rate hike by the Fed this year. (2) Moving averages. The S&P 500 has remained above its still-rising 200-day moving average after briefly retesting it in early October last year. The S&P 500 Transportation index is currently back to its 200-dma. That’s a bit of a concern from a Dow Theory perspective, especially since the index’s 50-day moving average has turned down since it peaked on January 22. (3) Melt-up worries. Interestingly, in recent conversations with our accounts, I am finding that more of them are worrying about missing a melt-up in stock prices than about dodging a correction or a meltdown. What might trigger a melt-up? The obvious answer is a significant postponement of monetary normalization by the Fed. A more likely scenario is that the initial lift-off in interest rates might cause corporations to stampede into the bond market to raise funds for more buy backs and M&A. (1) Minimum wage. Anecdotally, the minimum wage was raised in 21 states at the start of the year. However, during March, average hourly earnings rose only 2.1% and 1.8% for all workers and for production and nonsupervisory workers. (2) McDonald’s. On 4/15, fast-food cooks and cashiers demanding a $15 minimum wage walked off the job in 236 cities in what organizers called the largest mobilization of low-wage workers ever. On April 1, McDonald’s announced plans to give employees a 10% pay bump and some extra benefits. The raise will affect about 90,000 workers at a small fraction of McDonald’s stores. Employees at franchises, which make up the majority of the burger chain's locations, won't be affected. (4) Quit rate. The quit rate in retailing tends to be relatively high, especially among low-paid workers. Retailers are raising their wages to reduce their labor turnover costs. (5) Q1 wages and prices. Average hourly earnings for all workers rose 3.9% (saar) during the first three months of the year, the highest since December 2008. That’s the kind of y/y increase that Fed officials have said would allow them to normalize monetary policy sooner and at a faster clip. In addition, the core CPI inflation rate edged back up to 1.8% during March, closer to the Fed’s 2% target--which is really for the core PCED, which was 1.4% during February. The three-month annualized change in the core CPI through March was 2.3%, suggesting that the core PCED, which was 0.9% through February, might show a higher increase when March data are released on Thursday, April 30. Over the past couple of decades, China’s growth was supercharged by lots of debt that was used to expand industrial capacity to employ the huge influx of new workers into the labor market resulting from the demographic dividend. The Chinese have a very high saving rate. As some of them prospered, they poured their savings into properties; many built in the country’s “ghost cities.” Now China has a glut of industrial capacity spewing out life-shortening pollution and a speculative bubble in real estate that is quickly losing air. The government continues to provide lots of easy credit, but it has lost its bang-per-yuan for stimulating growth, and instead is fueling a speculative bubble in stocks. Real GDP rose 7.0% y/y through Q1-2015, the weakest growth rate since Q1-2009. Haver Analytics calculates that the seasonally adjusted and annualized quarterly growth rate was 5.3%, also the weakest since Q1-2009. Industrial production was up only 5.6% y/y in March. It’s very unusual to see production growing below real GDP. Over the past three months through March, bank loans are up at an annual rate of 16.9 trillion yuan ($2.7 trillion dollars), the highest since March 2009! Yet despite all that liquidity, real GDP growth continued to move lower. Both the S&P and the US Bureau of Economic Analysis reported that profit margins dipped during Q4-2014. The former was at 10.2%, while the latter was at 10.4%. But both remained near their record highs of the previous quarter. One of our accounts observed that data that I compile are showing a possible peak in the forward profit margins of the S&P 500/400/600. That’s not so clear for the S&P 500, where the margin peaked at a record high of 10.8% during the week of December 4, 2014. It did dip recently, but edged up over the past few weeks back to 10.6% in early April. The dips are more noticeable and remain underway for the SMidCaps. For the S&P 400, the forward profit margin is down from last year’s peak of 6.7% during the week of June 19 to 6.2% currently. For the S&P 600, it is down from the 2013 peak of 6.1% during the week of October 3 to 5.5% currently. The perceptive fellow who brought this to our attention wondered why margins seem to be coming down more for smaller than for larger firms. That’s a good question, assuming that the forward profit margins accurately reflect the situation. We think so. We calculate the data by dividing forward earnings by forward revenues. The pace of employment has picked up over the past year. ADP data through March show that payrolls are up 2.9 million y/y, with large companies adding 546,000, medium-sized companies adding 1.0 million, and small companies adding 1.3 million. The additional payrolls may squeeze margins more for small firms than for large firms simply because add-to-staffs are more significant to the budgets of the former than the latter. In any event, profit margins may be peaking across the board, though they aren’t likely to tumble until the next recession. If they have peaked, then profits growth will be determined mostly by revenues growth, which is likely to be below 5% this year and next year. Yesterday, the price of a barrel of oil gave back recent gains after Saudi Arabia reported record production of 10.3mbd in March, a figure the country's oil minister said was unlikely to fall by much. They are obviously aiming to keep oil prices down to hurt Iran, and Russia too. In addition, yesterday we learned that US crude oil inventories soared to a record-high 482.4 million barrels during the week of April 3, 2015, up 26% y/y. The Saudis are also hoping that low crude oil prices will significantly reduce the output of US frackers. There is no sign of that happening just yet. US oil field production remained at 9.4mbd during the first week of April, following a seven-week climb. The US still imports 9.6mbd, though that’s about as low as levels were during 1996. Furthermore, US exports of petroleum products are at a record 4.3mbd. US merchandise trade data show that in current dollars, US oil imports have dropped by a whopping $274 billion (saar) from the most recent high of $470 billion during May 2011 to $196 billion during February. The trade deficit in crude oil and petroleum products has dropped by $258 billion to $97 billion over this period. In current dollars, US oil exports are down $70 billion over the past six months through February as lower oil prices more than offset the increase in exported barrels. Stock investors have been going global rather than investing in the US. While going global has been mostly driven by relative valuation considerations rather than relative earnings, global fundamental economic indicators are generally improving. The reasons could be that lower oil prices are boosting global growth and that the stronger dollar is redistributing growth away from the US to other countries. Especially impressive is the rebound in the JP Morgan Global Composite Output PMI from a recent low of 52.4 during December to 54.8 last month. The increase has been led by the service component, while the manufacturing component has meandered between 51 and 52. The Eurozone has been leading the improvement in the global composite, rising from a recent low of 51.1 during November to 54.0 during March. The March PMIs suggest that manufacturing may be weakening in the US, while services are holding up. Japan’s M-PMI (50.3) and NM-PMI (48.4) were relatively weak last month. China’s M-PMI continues to hover around 50.0, while its NM-PMI has remained solidly above that level at 53.7. Both indexes are strong in the UK. Until the March report, the past few monthly employment reports indicated that the economy was performing better than suggested by other economic indicators. Turns out that not only was March weak with a nonfarm payroll gain of only 126,000 but January’s advance was revised down by 38,000 to 201,000 and February’s was lowered by 31,000 to 264,000. Those are the first back-to-back downward revisions since February/March 2011 (based on first-reported data). Downward revisions tend to occur when the economy is contracting. They are rare during expansions. Since 2011, there have been only 9 downward revisions but 41 upwards revisions. If the weather is to blame for the latest reductions, that’s not a problem. It’s hard to find much positive news in the March report. The household employment survey found that full-time jobs rose 190,000 to a new cyclical high, while part-time positions fell 170,000. That’s good, but total household employment rose just 34,000 during March. The labor force fell 96,000. Bad weather seems to have had some impact on depressing employment during the first three months of the year. But so did the strong dollar, weak oil prices, and slow economic activity abroad. The dollar may be starting to stabilize, and the price of oil may be bottoming. Economic activity seems to be improving in the Eurozone. In any event, I expect that April’s employment report should show a spring rebound. If so, then the Fed would remain on course for one-and-done for this year, if not in June then in September. (1) Business surveys. Yesterday we learned that the latest survey of manufacturing purchasing managers showed a decline in the M-PMI to 51.5 during March from 52.9 during February. I wasn’t surprised since the overall index is highly correlated with the average of the composite indexes for the six available regional business surveys. This average fell to -0.1 during March, the lowest since April 2013. The same can be said for the orders and employment components of the national and average regional surveys. The average regional orders index was especially weak in March, falling to -9.6, the lowest since May 2009. The national orders index (51.8) wasn’t as weak, but it was down from February (52.5). The national employment index (50.0) was weaker than suggested by the regional average, which edged higher during March. It’s getting harder to blame the weather. Of course, other factors are working to slow the economy. The strong dollar’s negative impact is visible in the M-PMI’s new exports component, which dropped to 47.5 in March, the lowest reading since November 2012. 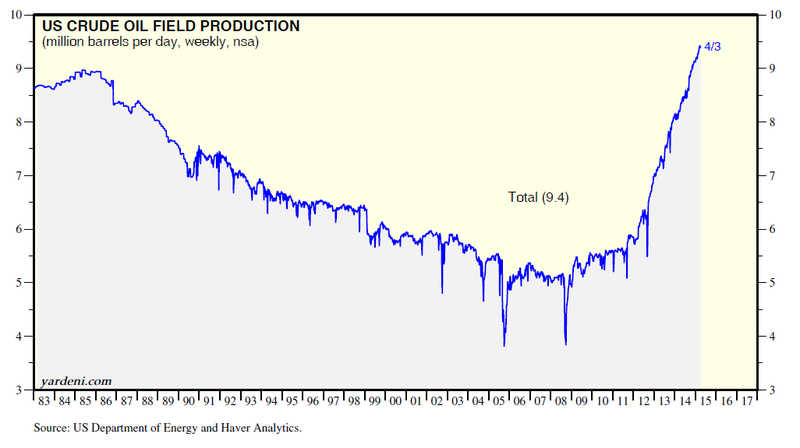 The plunge in oil prices may be depressing energy-related new orders as well as production. (2) Employment. Yesterday, we also learned that the ADP measure of private payroll employment rose 189,000, the weakest since January 2014. It may be that energy-related employment is taking a hit from the drop in oil prices. The four-week average of jobless claims in North Dakota, Ohio, Pennsylvania, and Texas has spiked up recently from 41,210 near the end of last year to 54,408 in mid-March. The PBOC is committed to doing whatever it takes to boost China’s flagging economy. The central bank started lowering interest rates late last year and bank reserve requirements early this year. As a result, the China Shanghai ‘A’ stock price index (in yuan) has soared 53.1% since November 19. Markit reported bad news on China’s M-PMI, which fell back into contractionary territory in March. It sank from 50.7 in February to 49.6 last month, which was slightly above an earlier flash estimate of 49.2. On the other hand, the official M-PMI rose to 50.1 in March from February's 49.9. On Monday, the PBOC, the housing ministry, and the banking regulator said in a joint statement that buyers of second homes would be required to make a minimum down payment of 40%, down from the previous 60%, as part of efforts to stimulate the housing market. China new home prices registered their sixth straight month of annual decline in February, as tepid demand continued to weigh on sentiment despite the government's efforts to spur buying. New home prices fell 5.7% y/y in February, according to Reuters calculations based on data from the National Bureau of Statistics. The reading was worse than January's 5.1% decline and marks the largest drop since the current data series began in 2011. On Sunday, Zhou Xiaochuan, China’s central bank governor, said that he is concerned about signs of deflation and that policymakers are closely monitoring the slowing of global economic growth and declines in commodity prices. He added that the central bank is “vigilantly” ready to battle deflation. The Shanghai ‘A’ stock price index jumped 2.6% on Monday. In the past, there was a good correlation between the China MSCI (in yuan) and the CRB raw industrials spot price index. They’ve diverged since early last year, suggesting that while slowing growth in China is bearish for commodities, it is bullish for stocks because the PBOC will be forced to ease. Bad news is good news.